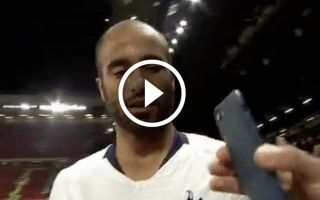 After cameras picked up some Man Utd fans taking selfies with Lucas Moura after their defeat to Tottenham, it hasn’t led to a kind reaction. The Spurs ace scored twice in his side’s 3-0 win at Old Trafford on Monday night, leaving Jose Mourinho’s side with just three points from their opening three fixtures. After seeing off Leicester City in their opener, they’ve now lost to Brighton and Tottenham while conceding six goals in those games, and so the Portuguese tactician now has plenty to think about ahead of the trip to Burnley on Sunday to avoid falling further behind their rivals. However, the fans seen in the video below are facing a backlash after Sky Sports cameras picked them up asking for selfies with Moura as he left the pitch after the game. Judging from the comments below, some fans were raging over it and couldn’t quite believe what they were seeing as the Man Utd fans posed for pictures with a player who had just inflicted defeat on them. Perhaps there is an innocent explanation for it as they may well be Brazilian and wanted a photo with the 26-year-old. Nevertheless, it doesn’t look great and the club have come under fire for it with many labelling it ’embarrassing’. ‘Fans’ lol, what an embarrassment ?